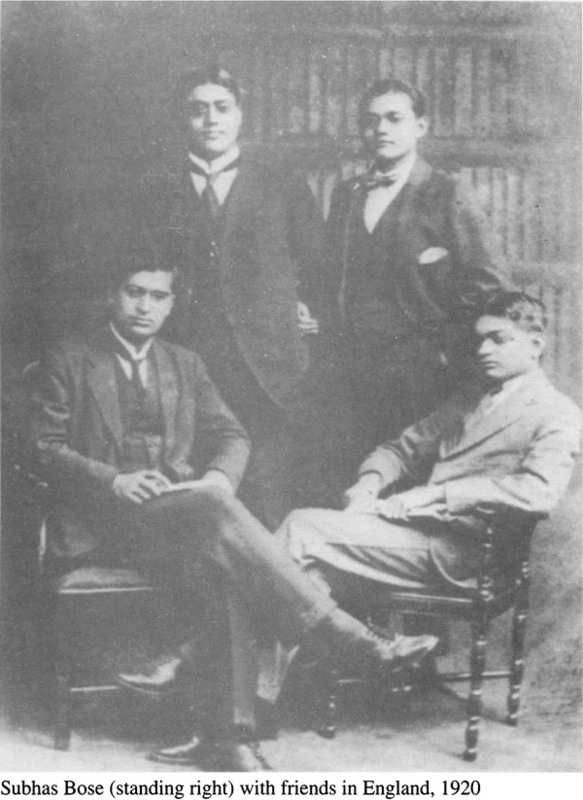 Subhas Chandra Bose and his elder brother Sarat were among the most important leaders of the Indian struggle for independence from the British and were active from the 1920s through the 1940s. Brothers Against the Raj is the definitive biography of the Boses, placing them in \the context of the Indian freedom struggle and international politics of the period. Leonard A. Cordon uses materials gathered in Europe and Asia from archives, records, and 150 interviews he conducted with the brothers' political contemporaries and family members. The author makes use of hundreds of unpublished letters and other previously untapped sources as well. Brothers Against the Raj brings these two controversial leaders and a significant epoch in India's history to renewed and explosive life. The crowd gathered in downtown Calcutta, January 23, 1964, as they they did every year on that day to celebrate the life and triumphs of Bengal's foremost nationalist leader, Subhas Chandra Bose. Immense representations of Bose were paraded through the streets en route to the Calcutta maidan (park). 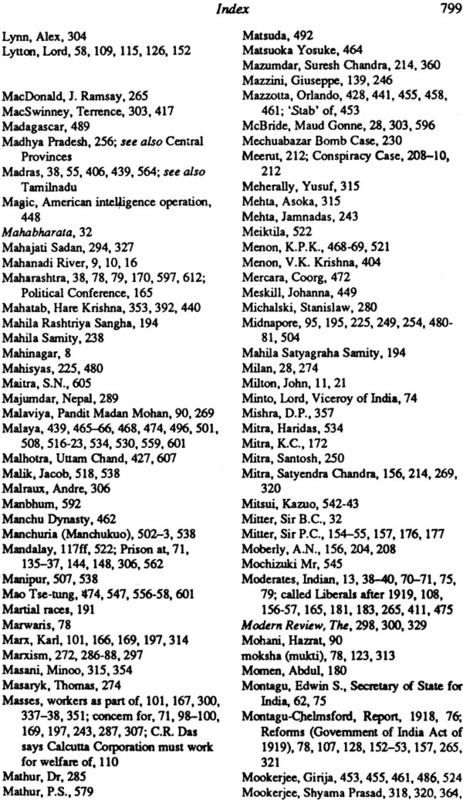 'Netaji ki jai. .. Netaji zindabad ... ' (Victory to the revered leader Subhas Bose ... Long live the revered leader) they shouted. It was my first winter in Calcutta where I had come to do research on Indian nationalism. Subhas Bose, born in 1897. had died in a plane crash on Taiwan in August 1945. Or had he? During the fo1\owing months I saw pictures of a sadhu (holy man) on Calcutta lampposts and billboards throughout the city. His head was shaved and he stood beside the dead body of Jawaharlal Nehru. India's recently deceased prime minister. The sadhu wore glasses (as did Bose), he was a little older, a little plumper. but he did resemble Bose, or 'Netaji' as he is commonly called. Beneath the picture in Bengali it said: 'Who is this sadhu?' 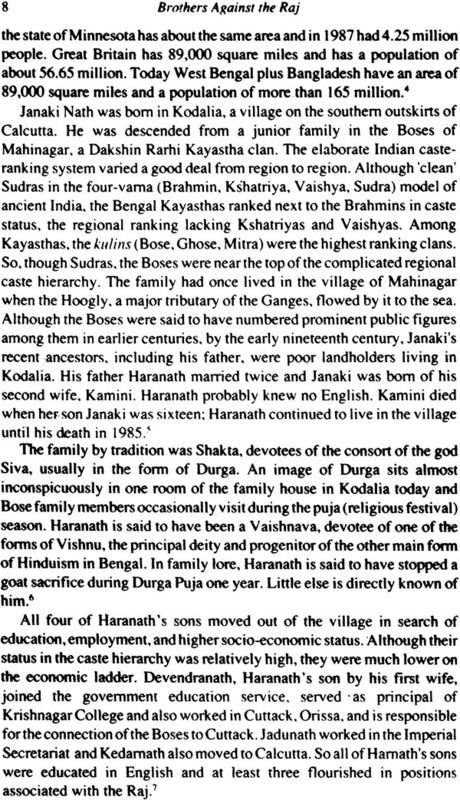 Many ordinary Hindus in the middle and lower classes of the metropolis and the outlying districts believed that it was Bose. He was biding his time. waiting for a time of crisis when he would return, take the helm of the ship of state, and guide it through the troubled seas of independence. Small cult groups told of his imminent coming to this or that public meeting, but he did not appear. Major Satya Gupta, once an 'officer' in the Bengal Volunteers, sent me an invitation to an exhibition which he said Netaji would attend. Gupta said, 'Netaji passed my way,' suggesting that he had seen him recently. I went to the exhibition of a small, scale-model of a religious community at Shaulmari in north Bengal where Bose was said to be resident. I was nervous, unsure of myself; I waited, but no Bose. 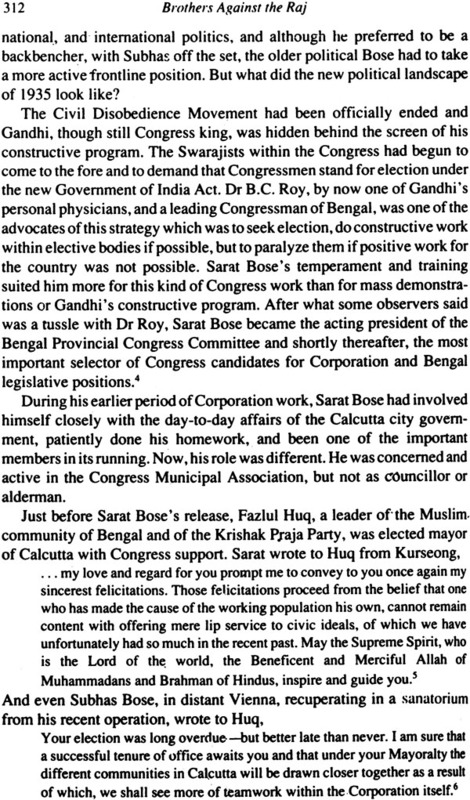 With the help of a young Bengali businessman, I gathered weekly publications which told of Bose' s activities since 1945, his present powers, and prospective deeds. I also read a popular Bengali book about the secret of the Shaulmari ashram. 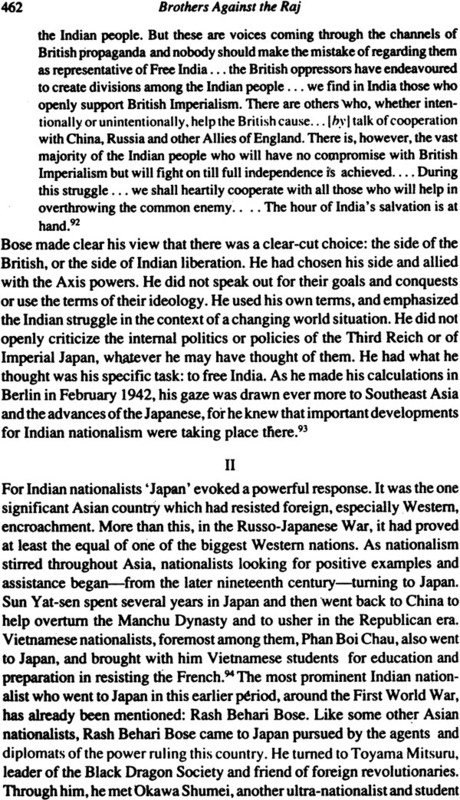 Gupta and his associates insisted that Bose was there now, alive and well, although the sadhu denied being Bose. 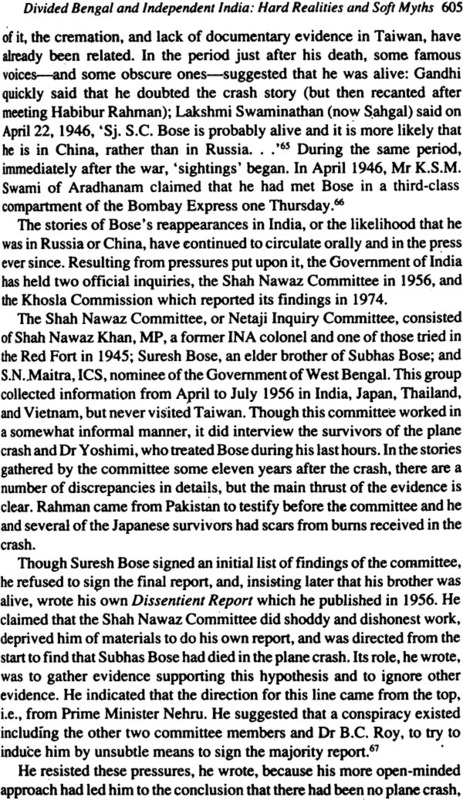 A few years later, I learned from a senior and respected Bengali Congressman, leader of the Congress Party in the Rajya Sabha, that he had traveled to the ashram in the hope of finding Bose whom he had known well. 'I could tell right away,' he said, 'it was not Bose.? 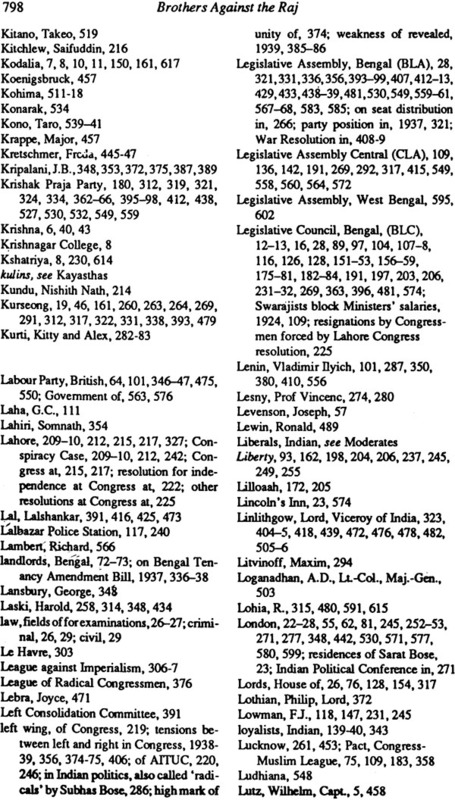 Having gathered material for a doctoral dissertation on aspects of the nationalist movement in Bengal, I went home- and finished my thesis, revised it, published it, and began teaching. fn 1975, in connection with research on the partition, 1 secured an interview with Lord Mountbatten. Within the brief hour-and-a-half I spent in his company, I not only heard him explain his approach to the question of a united Bengal in 1947, but witnessed how he could alternate fierce expressions of authority with an outgoing charm. Since he was busy advising on the running of the Royal War College when 1 arrived, and did not want an unknown interviewer poking around, he locked me in his bedroom. Twenty minutes later, when 1 thought he had forgotten me and already left for Germany, he unlocked the door and said, 'Now 1 am all yours.' I saw how eager he. was to have his version of the past and his view of his own role in history accepted by the general public and posterity. He also explained that his aversion to the Indian National Army (INA) meant that he would not see Sarat Bose during the crucial months in 1947 when the question of partition was being decided. 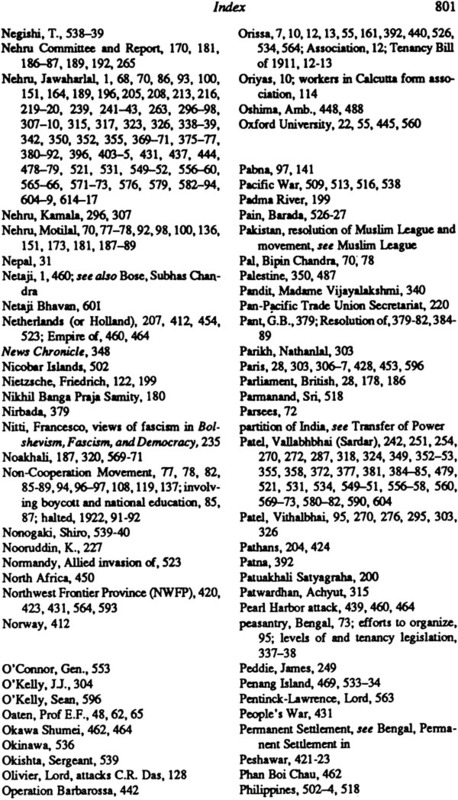 I returned to India and continued my research on nationalism and the partition and heard some. but fewer tales of Bose. When I returned during the Emergency in 1976, I learned at the Netaji birthday gathering from the then chief minister of West Bengal. Siddhartha Shankar Ray that, 'Bose is undying and will live forever.' Furthermore. he said. Bose was against fissiparous tendencies and taught obedience to authority. authority such as that wielded by the present central government of Ray's ally. Mrs Gandhi. Then the governor. A. Dias, told the assembled throng. 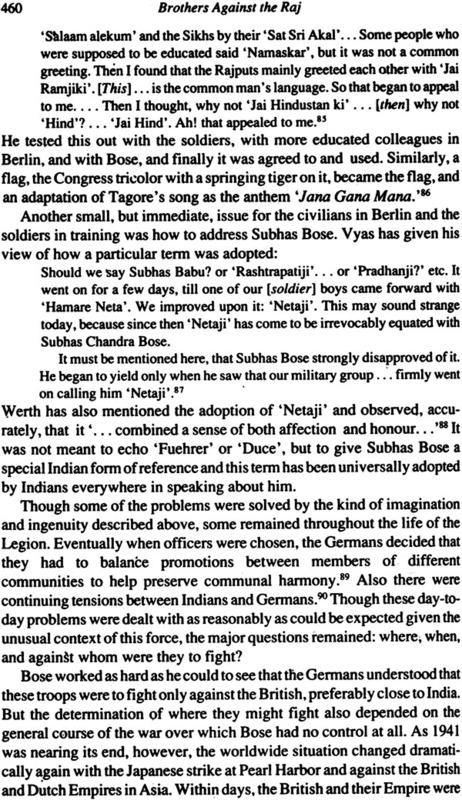 'Netaji highlighted the salient points of the twenty-point program.' That is. Bose, long dead. was a founder and backer of Mrs Gandhi's program. On this and later visits. 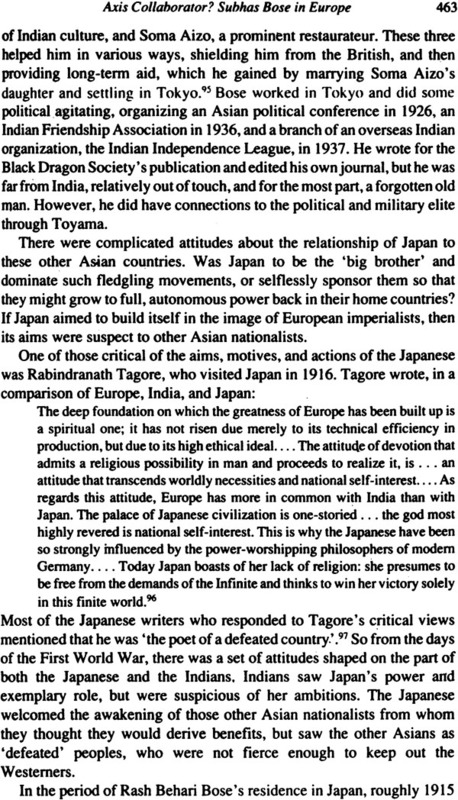 I heard from politicians of every persuasion that Bose was wise. prescient. and their ally. if not when he was alive. then in the present when they needed support. Communists. Congressmen. independents. left. right. center, Bose would always be available for their contemporary needs. They had conveniently forgotten how many of them had vilified Bose when he was alive. A dead hero is often a more convenient prop than a live one. Some liked to rewrite history. Acharya 1.B. 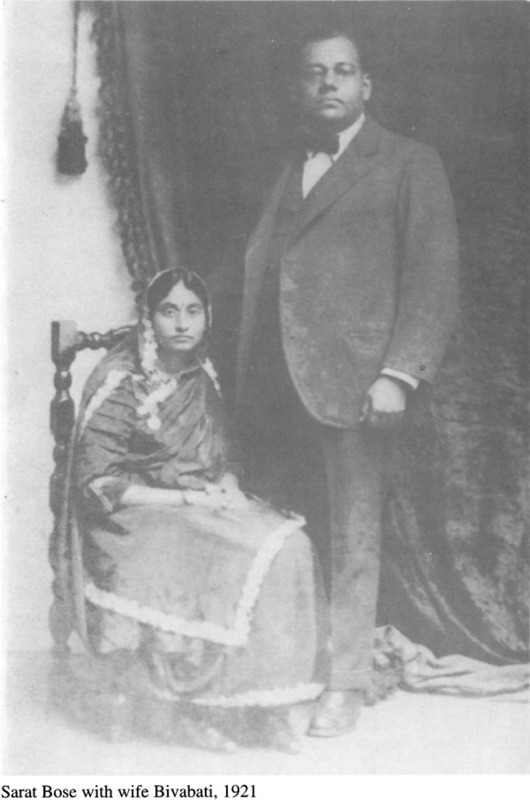 Kripalani insisted that Bose and he had gotten along beautifully when Bose had been Congress president. Well. 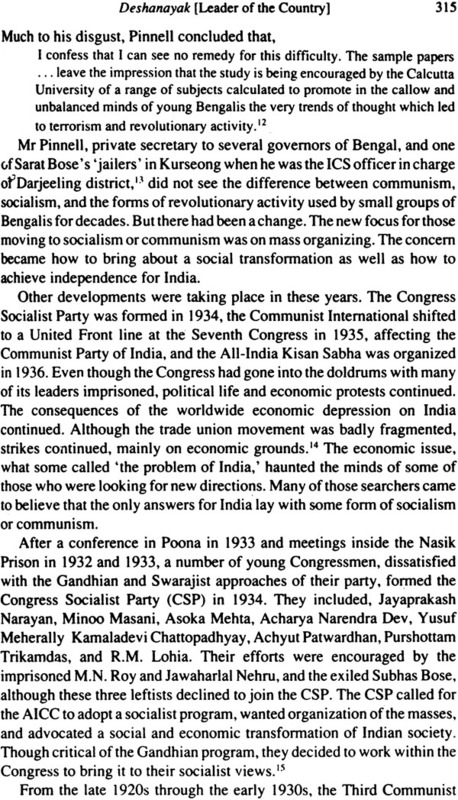 I had just been reading a letter that Kripalani had written in 1938 to Jawaharlal Nehru in which he explained that he wished to resign his post as general secretary of the Congress because he could not stand Bose. When I waved my notes on this letter before him. he brushed them aside imperiously. He was going to have the past is way. In 19791 went to Calcutta University to talk to the history faculty and students about 'Myths of a Hero.' 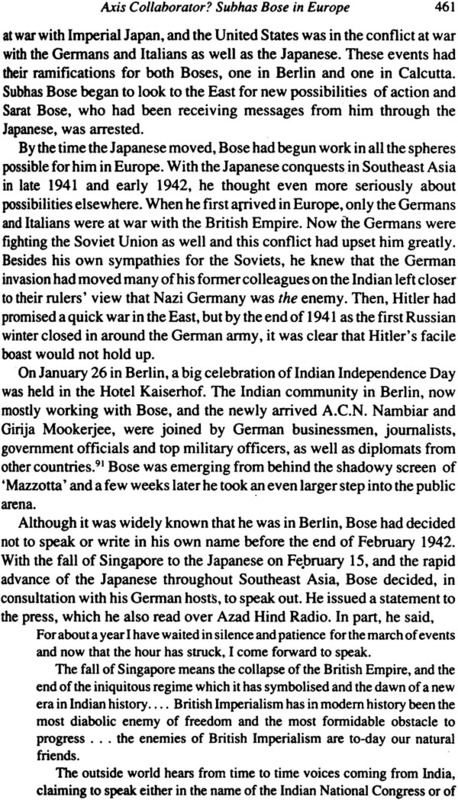 exploring the tales of Bose and the uses to which he had been put since 1945. I was met with a wall of silence. I was assured ,that Indians did not believe in myths any longer. My mentor. 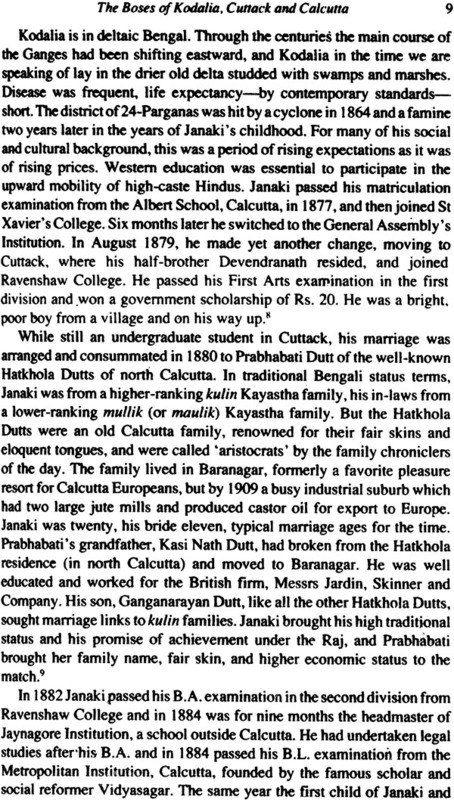 a senior Calcutta historian. told me to bring just' cold. hard facts' the next - time I came to talk. I was disappointed that they did not see-as I thought I did-that Bose was being assimilated into the Great Tradition of India. He was being linked to India's mythology. to her heroes. sadhus, and saints of bygone days. 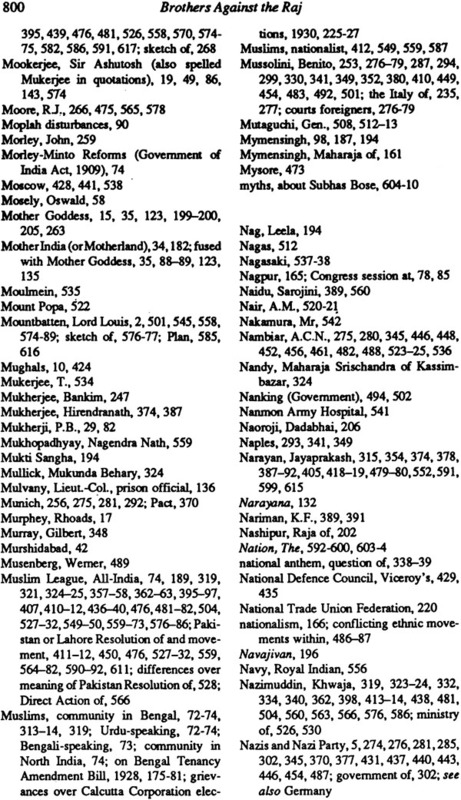 Myths are important constituents of the beliefs of millions of ordinary Indians. But more than this. 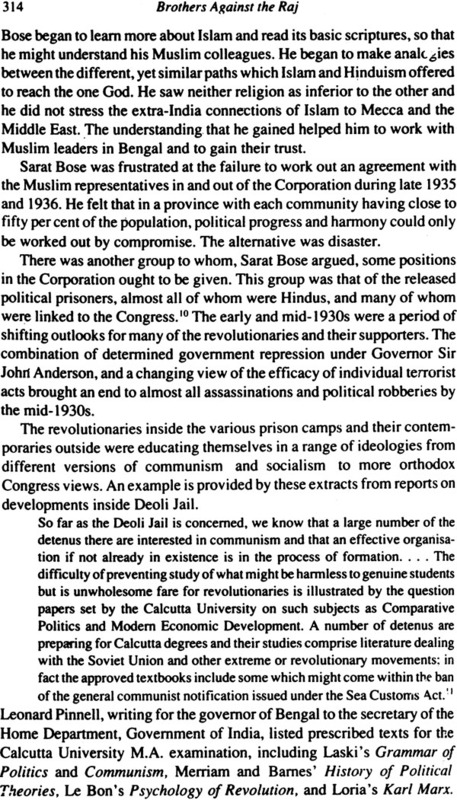 people' s hopes for the return of Bose also had to do with their discontent in the present and their disillusionment with politicians on the scene. In the same year. on January 23, 1979, Bose's birthday, I was startled to open my daily newspapers and see a picture purporting to be that of Subhas Bose, alive. 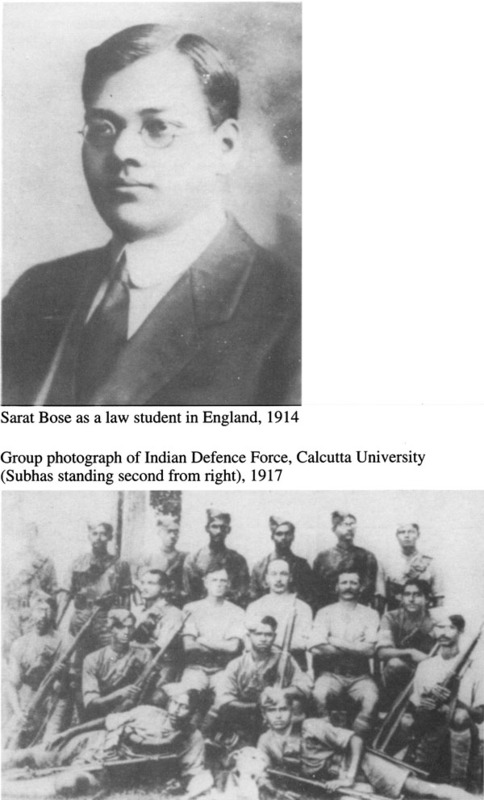 Keener eyes than mine in the Bose family immediately saw that the hands and body of the figure in the so-called 'photograph' belonged to Sarat Bose, whereas the head was that of Sub has Bose. Indeed, it was admitted a few days later by Mr Samar Guha, who had presented the item to the press. that he had gotten it 'somewhere' and it was a forgery. He said that he had not spotted the forgery himself and was simply a middleman. He was not responsible for the hoax that had been perpetrated on the Indian public. Somewhere along the line of my investigations. 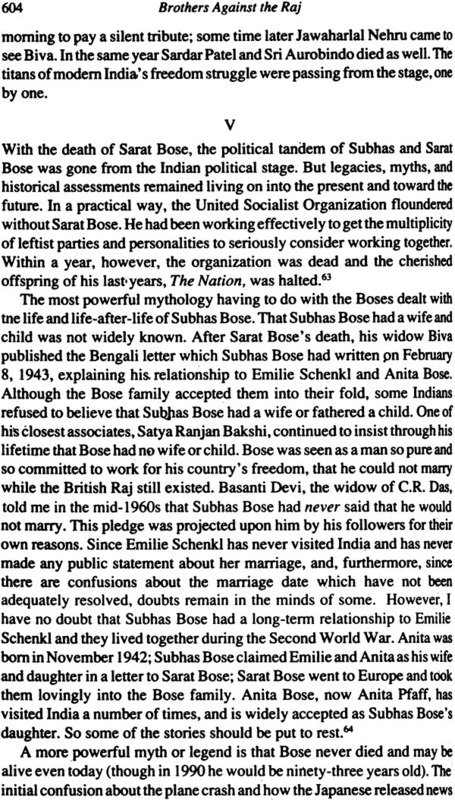 I saw that Subhas Bose was extraordinarily close to his brother Sarat Bose and Sarat made important contributions to his brother's activities. to the Bose family. and to Calcutta. Bengal. and India. It made sense. therefore. to include him in a dual biography. 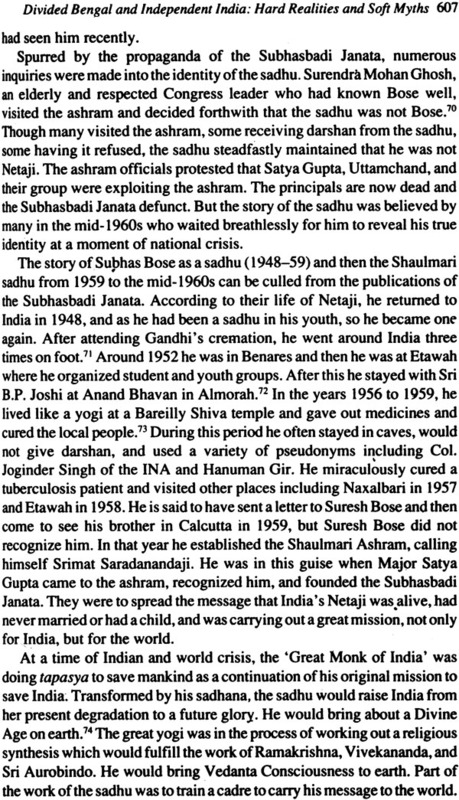 Some biographies of Sub has hardly mentioned Saratand there was no biography of Sarat-a few memoirs. but no significant historical writing. 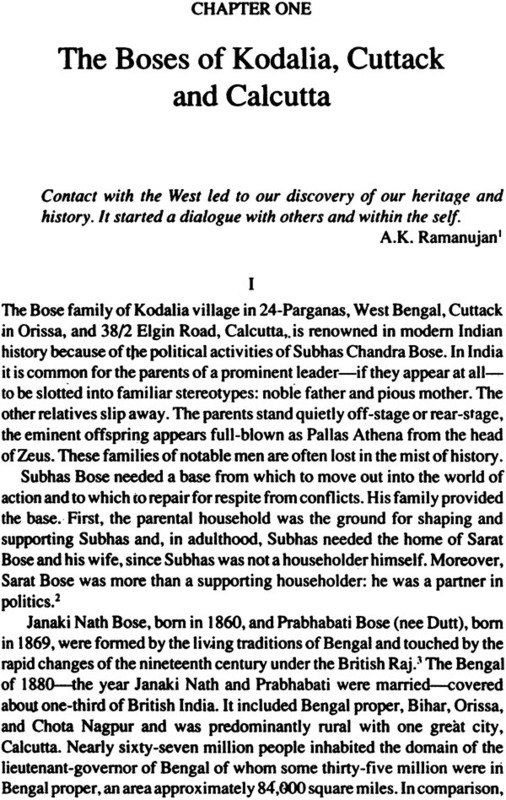 This decision drew me further into the Bose family which I learned was-like many large and famous families in India and elsewhere-a-replete with conflicts and rivalries. even hatreds. as well as love and kindred feeling. For a long time I was. and still am. identified with one unit of the extended Bose family. 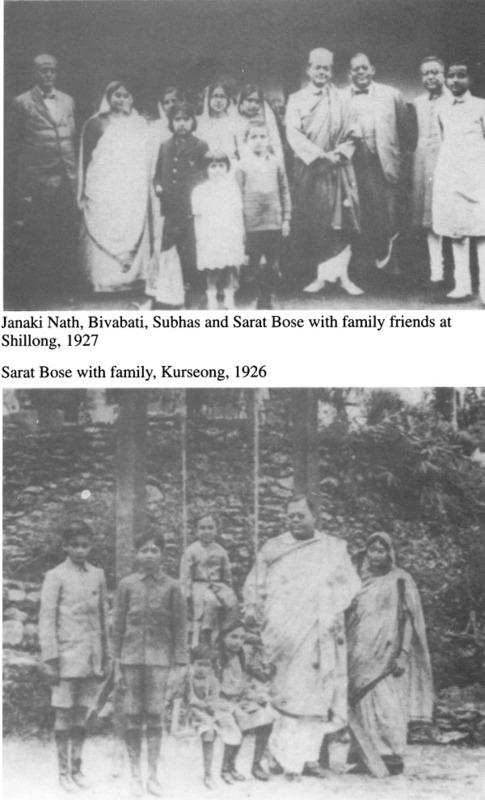 Or Sisir Bose (Sarat Bose's third son) and his immediate family. I had no axe to grind. but I was beholden to Or Bose and his immediate family for their help and direction. and even more for their support and warm friendship over many years. I learned too that there were a number of family members who did not want to go through Si sir. but who wanted to speak to me. I might be a major or a minor chronicler of the Boses-who could tell?--but they wanted to give me their version of the past. A scurrilous pamphlet. 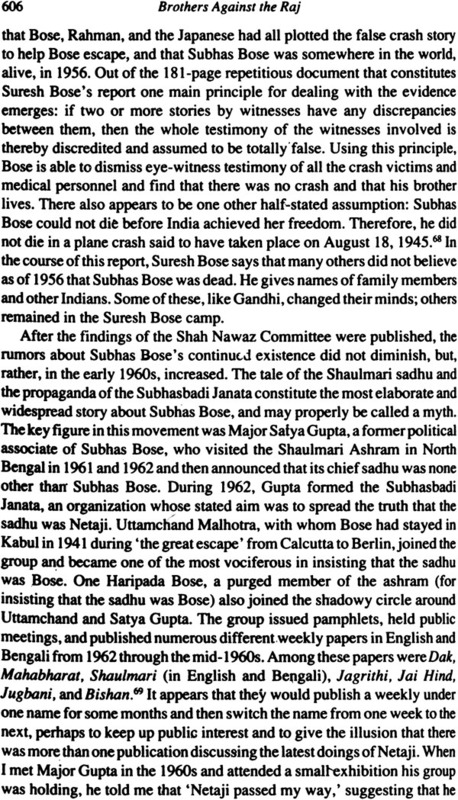 'Granada Television and Or Sisir Bose,' was produced accusing Or Bose, his immediate family. and their American contact. myself. of having and distributing monies from abroad for special purposes. 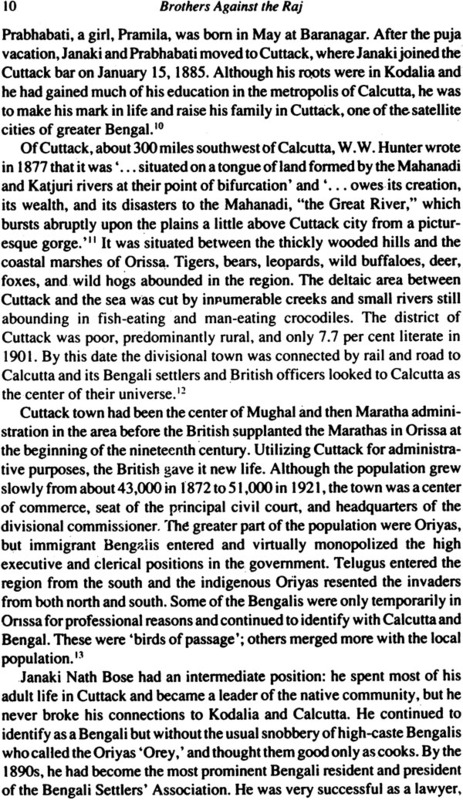 This absurd Bengali pamphlet-a tapestry of lies-seemed to be the work of a few harboring special grievances for reasons I never learned. I was described as the notorious 'Or Leonard Gordon, alias Lenny'. However. we all took this as comic relief after the nasty machinations of the Granada television producer whose efforts culminated in a distorted film on Bose and the INA which was shown throughout the West. 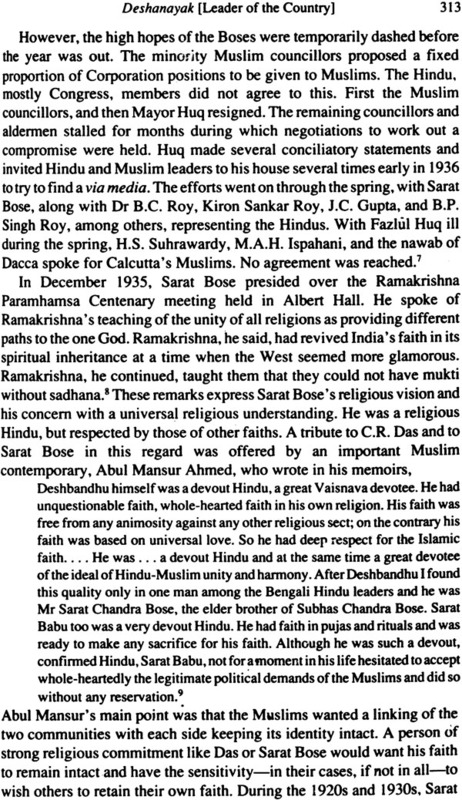 Some within the family who had helped me remained suspicious of an outsider and when the Statesman published a wildly inaccurate account of a speech which I gave in New Delhi they came to condemn Sisir Bose for having helped the dreadful wretch who had said such things. After the Statesman agreed to publish my version of what I had said (and it seemed rather mundane and even accurate). these voices quieted. One "family member though, was still not satisfied and said he would sue me for what the Statesman had invented. I invited him to do so.